We’re just out there having fun, and demonstrating that seniors can definitely move! Born in St. Louis, Pam and her family moved to Ashtabula, Ohio. Pam, who has four brothers and two sisters lands smack dab in the middle. And coming from a large family in Pam’s case, meant keeping active especially where sports are concerned. Pam claims to have especially excelled in cheerleading, basketball, volleyball, and tennis. Having a background in cheerleading and being athletic to boot, made her a shoo-in for Wine & Goldies. When Pam is not practicing or performing with the dance team, she is officiating basketball games and has been doing so for over 20 years. She officiates boys and girls high school basketball, Division I and II women’s semi-professional basketball, and men and women’s pro-amateur basketball leagues. Additionally, Pam is a member of the United States Tennis Association (USTA) and is currently working diligently on getting ranked as a senior professional. Pam is enjoying her second act career to the fullest and wants to let it be known that retirees should keep moving. She is thrilled that at this stage of her life, the activities she has chosen to pursue are fun-filled, inspiring and most importantly, they keep her moving. Pam chatted with 50BOLD about the importance of keeping active especially as you age. 50BOLD: What did you do before you retired? Pam: I was working in an office as an eligibility specialist with the welfare department where I determined eligibility for those who applied. 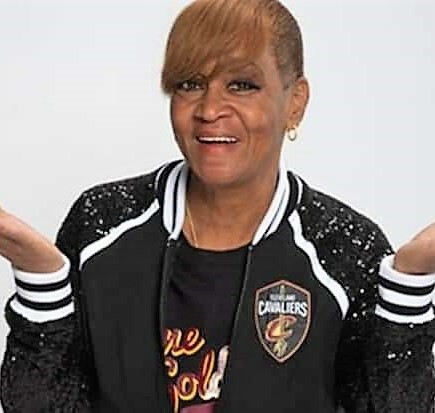 50BOLD: Now that you have retired, you have become a Cleveland Cavalier dancer, how did an opportunity like this come about? Pam: I am a Cavalier and a member of its Senior Dance Team. I was laying on the couch one day, watching the news and I saw a notice about auditions for the dance team. I saw the advertisement the day before the auditions were to take place! I thought to myself, “Oh, interesting. I’m just now finding out about the auditions. OK, I’m going to go do this!” I decided, if I made it, then fine and if not, then, at least I tried. I got up off the couch and felt very excited at the prospect of going to the audition. 50BOLD: Did you have to perform a routine? Pam: There was a routine that we had to learn in a half hour and we had to perform it with different groups. For the next segment, we had to perform a freestyle dance routine. The judges wanted to see how active we were and what moves we could do. Out of the 80 participants who attended the audition, only 20 were selected. As a matter of fact, this is the first year for the Cavalier’s Senior Dance Team, so we are making history. 50BOLD: Did you have previous experience? 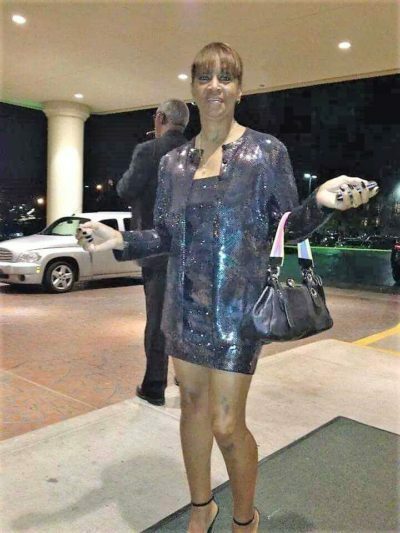 Pam: I had been a cheerleader in high school and continued doing so when I attended Central State University. I am also a professional basketball referee and so I am very much familiar with the game. I am also trying to get ranked as a senior professional with the USTA. 50BOLD: Pam, you are such an athlete! I’m amazed! Pam: I love staying busy and most importantly active. I refuse to sit down. Sitting down all time means inactivity. I hate being bored and not doing anything! I need to keep moving. 50BOLD: As a professional basketball referee, what kinds of games do you officiate? Pam: I officiate boys and girls high school games. I cover Division II and III women’s college games. And on a semi-professional level, I officiate men and women’s pro-amateur basketball leagues and this allows me to travel to states like Michigan, Illinois, and Indiana. 50BOLD: How do you stay in shape? Pam: I work out every single day. I have brothers who are bodybuilders so they send me routines and I make up a few of my own to stay in shape. I am constantly playing tennis and running up and down basketball courts, doing these kinds of activities give me stamina. 50BOLD: So, Pam, you have not stopped working out since high school? 50BOLD: Do you have to watch what you eat? Pam: I don’t really have to watch what I eat because I am so active. I really never liked meat. I got away with not eating meat from about age eight. I, however, am not a vegetarian. I will eat chicken and fish. 50BOLD: So no weight issues for you? Pam: I’ve never had a weight issue. So for my birthday this year, I’m going to have a work out party! The affair will be held at a gym and those who attend will have to work out! The party guests will have to exercise which includes doing Zumba and line-dancing. Everyone will be working out at my party and it will be fun! 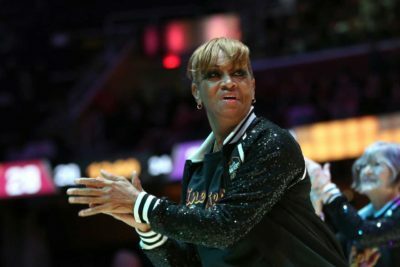 50BOLD: Is Cleveland the first with a senior dance team? 50BOLD: Do your dance routines happen during half-time? Pam: The performances typically take place after the first quarter and we have a minute and 30 seconds to dance. We also perform with the children’s dance company, the Cavalier Littles. 50BOLD: Do you wear uniforms? Pam: We do wear uniforms, they are black and with white stripes and accented with sparkles on the sleeves. They have the Cavaliers’ logo and our names are in gold. 50BOLD: Are you paid for your performances? Pam: We do get paid for our practices and for our performances. 50BOLD: Do you have to maintain a certain weight? Pam: We don’t have to maintain a certain weight and as a matter of fact, we have a couple of healthy members. 50BOLD: How long do you think you will be doing performing with the dance team? Pam: I will remain with the dancing with the team for as long as they allow me to do so. It’s fun. It’s entertaining. And since I’m a basketball referee, I get to watch basketball and the other referees at the games. I find that I can still learn from other people, so I watch what they do as they are officiating. I examine the referee’s positions and how they chose to make calls. I actually dissect the basketball games. 50BOLD: There aren’t too many female basketball referees, right? Pam: I am familiar with two professional female NBA referees who are no longer officiating. Dee Kantner who is white was fired from the NBA. Violet Palmer, who was a referee in the NBA and WNBA was the first woman to officiate an NBA playoff game. Palmer retired in 2016. 50BOLD: Pam, what advice would you give to a retiree who wants to try their hand at something they’ve always wanted to do but were afraid to carry it out? Pam: I’d tell the retirees to wake up from their dream. Don’t sit there and say, “Oh, that looks like fun!” Get up and try it! Don’t let opportunities pass you by, be part of the fun, make things happen for you. 50BOLD: Is there something about you that most people don’t know? Pam: I really am a fun-loving person. Most people think I’m a very serious person because when I am officiating a basketball game, I have these expressions that can be off-putting to some people. 50BOLD: You have to put that game face on. Pam: Yes, I have to put that game face on and sometimes it’s hard to answer questions. I just answer questions directly. An audience member will ask me, “Do you know what time it is?” I look at my watch with my solemn expression and respond, “Yes, I know what time it is.” Do I give them the time? No! I’m in a disciplined situation that makes me appear mean. So, I am not able to react the way you want me to in a given situation. 50BOLD: Do you compete in tennis tournaments? Pam: Yes, I do. I am part of the United States Tennis Association (USTA). I play in tournaments and hopefully, within the next year or so, I will get ranked as a senior professional. 50BOLD: How do you get ranked? Pam: You have to play in certain tournaments where you are observed. And the association will then give you a ranking. 50BOLD: How long have you been playing tennis? Pam: I’ve been playing tennis since high school. I was the number one seeded in college. I was the number one seeded in singles. I was the number one seeded in doubles with a left-handed partner. 50BOLD: Pam, you really stay active. My mother motivated me to do something and to be something. I tried out for practically every team at school. I made everything that I tried out for– basketball, volleyball, cheerleading. Pam: My mother Mary Frances is now deceased but I feel her within me. She’s still pushing me to do more of what I am supposed to do. 50BOLD: You are very unique. You don’t usually see people of a certain age involved in so many activities. It is very impressive. Pam: My four brothers also gave me my motivation. Two of my brothers are professional bodybuilders. They have their pro-cards. I have two nephews that have their pro-cards as well. I have one brother, Roy Thomas, who truly motivates me. Roy was in a car accident where he broke every bone in his body and the doctors told him, he would never ever walk again. He told the doctor to put a Band-Aid on wherever it was needed and he’d do the rest. My amazing brother rehabilitated himself. We worked out together. I told him that I’d never let him down. We worked out in water. We rode bikes. Roy has ridden his bike across the United States three times already. He really built himself up. He is now a professional bodybuilder and owns his own gym. Roy is my ride or die. Roy and I are ten years apart, I am older, but you’d think we were twins that’s how close we are. 50BOLD: What advice would you like to impart to our 50BOLDers? Pam: Hopefully, I can motivate somebody to get up off the couch. Try to keep things moving especially as you get older. Go outside, smell the fresh air and walk. Keep things moving is the best way to be, the healthiest way to live! Challenge yourselves to do just a little more with each day. You can start small by even using a couple of canned goods as weights to exercise your arms. Exercise will fuel you! Previous articlePlanning a celebration of life?